Regardless of your political leanings and whether you advocate for more or for less government, governments play a central role in organizing and delivering services that citizens cannot do on their own, like building and maintaining infrastructures, organising transportation or offering health services. GovTech is how the nascent ecosystem of startups and tech companies aiming to digitalise government are known. Transforming the public sector to offer new public services and make it more efficient, fast and more transparent and ease the communication between government and its citizens. In the end, the public sector will bring all their services online, in a more transparent and cost-effective way. The government is eager to explore new technologies like artificial intelligence, internet of things and blockchain. Startups that solve critical ethical points for government employees will be the beneficiaries and govtech will prove to be one of the biggest market opportunities hiding in plain sight. Governments around the world spend $400 billion on IT and software each year to help improve agility and reduce bureaucracy. We reached out to some of the top influencers on our list to ask them for their views on GovTech. We spoke to Karen Hunter (#1), Evan Kirstel (#5), Lisa Abeyta (#7) and Marc R. Gagné (#18). Be sure to follow them to stay up to date on the best content and resources on GovTech. Lisa Abeyta – Founder and CEO at APPCityLife Inc. 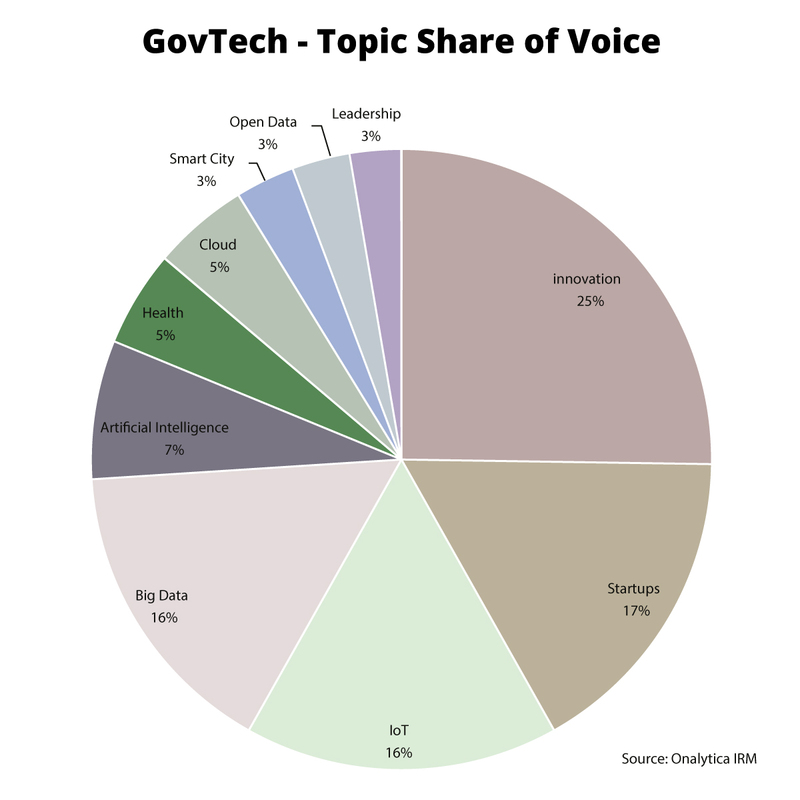 The most popular topic mentioned in tweets and blogs by the top GovTech influencers was Innovation with a 25% share of voice, illustrating how most of the influencers think Government needs more technical innovation. Startups was second with a 17% share of voice reflexing GovTech is a new sector and most of the companies working on this space are small Startups. IoT and Big Data were the 3rd most popular topics both receiving 16% of all mentions among the top GovTech influencers and brands. The next most popular topic was AI with a 7% Share of Voice. Health and Cloud received a 5% share of voice. Meanwhile, Smart City, Open Data and Leadership got 3% of all mentions. We were very interested in seeing which brand and individuals were leading the discussion around GovTech, so we analysed over 390K tweets mentioning the key words: govtech OR “gov.tech” OR “gov tech” OR ((“public services” OR public services OR “transport service” OR transportservice OR “transport services” OR transportservices OR “health service” OR healthservice OR “public sector” OR publicsector OR government) AND (“new tech” OR newtech OR “new technology” OR newtechnology OR “emerging tech” OR emergingtech OR “emerging technology” OR emergingtechnology OR efficiency OR innovation OR “tech firms” OR techfirms OR “technology firms” OR technologyfirms OR “tech companies” OR techcompanies OR “technology companies” OR technologycompanies)) from 7th October – 29th October 2016. We then identified the top 100 most influential brands and individuals leading the discussion on Twitter. What we discovered was a very engaged community, with much discussion between individuals and brands. 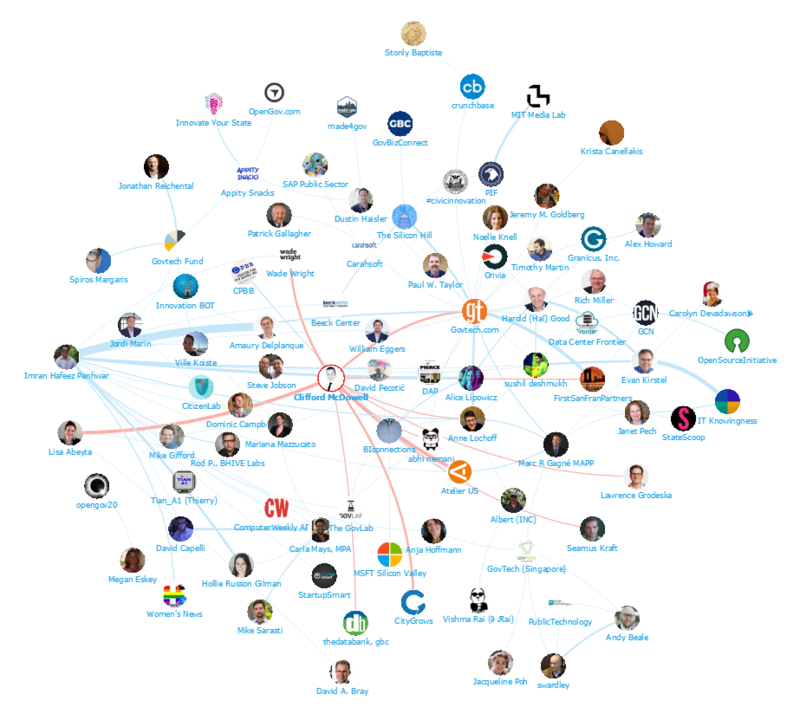 Below you can see a network map of the online GovTech conversation with the Top 20 influencer Clifford McDowell at the centre. This map was created with our Influencer Relationship Management software (IRM). Be sure to click on the map to enjoy the full size network diagram in greater detail. Below you can see another network map created with our Influencer Relationship Management software (IRM) showing the number 1 brand GovTech.com and number 1 individual Karen Hunter at the centre and all the GovTech conversations to and from the influencers in their field. If you are interested in learning more about identifying, managing and engaging with influencers click here to get in touch! 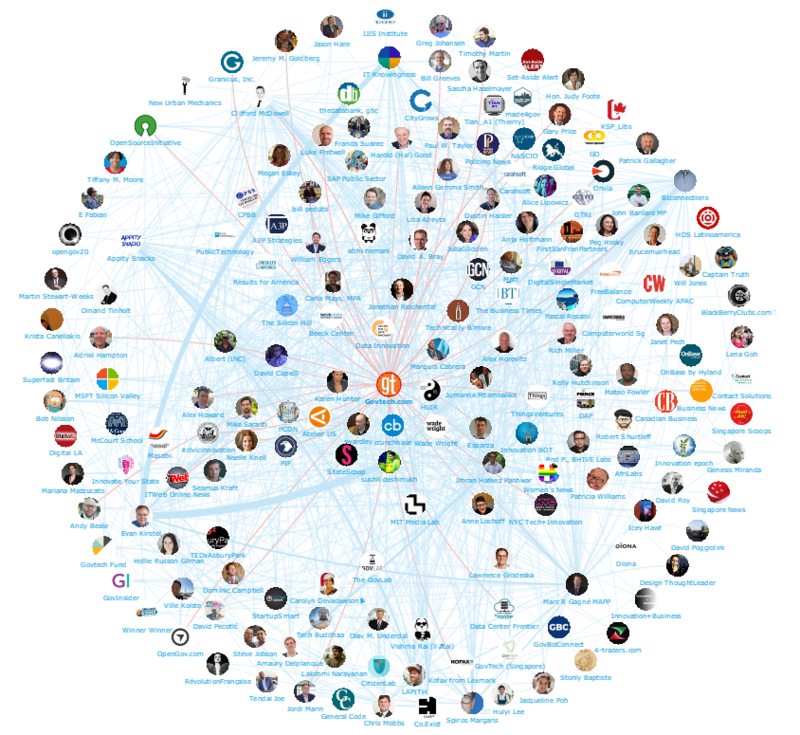 We looked at all the individuals engaging on Twitter to bring you a list of the top influencers in GovTech. Below is the top 50, if you want to see who ranks from 50-100 be sure to download the full report by clicking the download button below. We also looked at all the brands engaging on Twitter to bring you a list of the top brands talking about GovTech. Below is the top 50, if you want to see who ranks from 50-100 be sure to download the report to get the full top 100 list, and see who are most the influential brands in GovTech. Disclaimer: As ever with these lists, it must be stressed that the ranking is by no means a definitive measurement of influence, as there is no such thing. 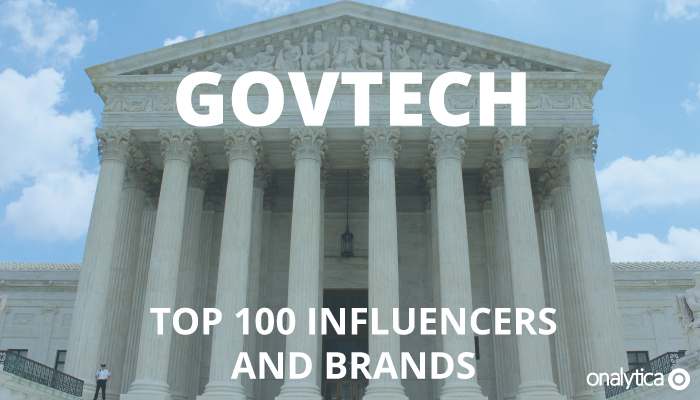 The brands and individuals listed are undoubtedly influential when it comes to driving discussion around GovTech.